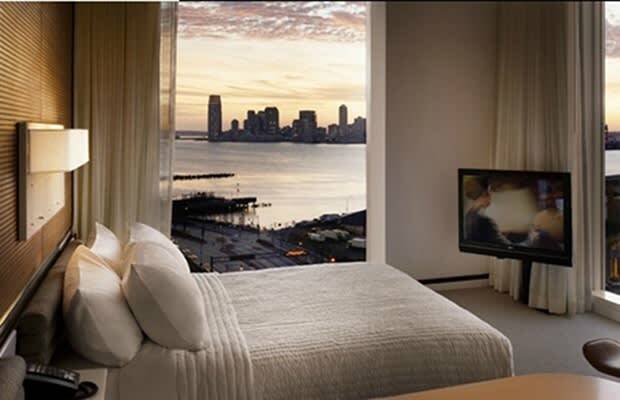 Floor to ceiling windows with surreal views of the NYC skyline and the Hudson River make a visit to one of Andre Balazs’ 337 guest rooms anything but standard. You already know you’re in for something different upon entering the space odyssey of a lobby, which hints at the founding father’s love of whimsical, yet sophisticated design (which you can also notice on display at the much-loved Standard Grill, where the floor is made of pennies, or in the airy Biergarten, where the Garden Room ceiling is erected from mugs). But onto the good stuff: Those too broke for boating can slip into their complimentary hooded robes and enjoy captaining festivities in one of the subtly naval-themed Standard or Superior rooms, which are furnished with deep soaking tubs, open bathrooms, and loungey sitting areas (look into the Summer Bummer special: They’re up for grabs as low as $225—almost half-price). Wood-slatted walls and ceilings further compliment the “I’m on a boat” vibe. However, those who’d prefer to party like true rockers can cough up for an Empire Suite, which in addition to black shag carpet and all-marble everything, features its own private lounge area (for those who’d rather club from the comfort of their room), top shelf minibar, and unobstructed views of the Empire State building, which are best enjoyed while blasting Alicia Keys.